If you get into fifth gear at the thought of prowling a museum stocked bumper to bumper with cars, motorbikes, karts, vans and even tractors, then look no further. Here is the top 10 museums from across the UK and around the world that will get even the most tame motorsport fan revved up. Ranging from sites where land speed records have been set to the home of Nascar and Ferrari, this guide puts you in the driving seat. Most people will have seen or used a Haynes car or bike manual at some point in their life, but did you know the owner of that company is also behind a huge motor museum in Somerset. Haynes International Motor Museum at Sparkford consists of four hangars filled with more than 400 cars, motorbikes and even a rickshaw - but then, this is the UK's largest exhibition of cars from around the world. Bentleys, Rolls Royces and more modern exciting super cars, like the Jaguar XJ220, feature at the museum and other classics include the Dodge Viper, Ferrari 360 Spider, Jaguar E Type and AC Cobra. With a nostalgic emphasis on 1950s and 1960s vehicles too, you can visit the Morris Garages dedicated to Britain's oldest and most prolific motor manufacturer. This area covers the Morris Story and has a 1930 MG M Type Midget and 1917 Morris Cowley. For motorbike fans, there's a good exhibition on Speedway with various bikes from different eras, bibs and leathers on the upper floor. Among the more interactive exhibits is the chance to colour a Mini using latest computer technology and see the history of the iconic car with details on how it came about. You can even look right inside the workings of a Mini as there is one that has been chopped in half. There's often special exhibitions that are on for a limited time and during my visit, there was F1 2010: Mark Webber and the RB6 to view. Even when that one leaves, there's nearly always an opportunity to see something similar as the museum is a stop-off point for a good range of touring exhibitions. Karting-wise, there's a test track and karting circuit next to the site, which is where Jensen Button first got into the sport. Children and adults can use the track, but will need to book in advance. If you have children, check out the Vroom Room children's activity area which includes a car puzzle pad, car rockers, car wash rollers, slides and a racer biff bash. If you're spending the day there, there's a pretty good cafe at the museum serving hot food and cakes that is well worth a pit stop. Sparkford, Yeovil, Somerset, BA22 7LH. Prices costs adult £13.95, children aged 4 to 15 £8.25, children under four go free, concessions of senior citizens, students and members of the forces £11.95. The Museum is open 9.30am - 4.30pm every day (5.30pm March to October) but is closed on Christmas Eve, Christmas Day, Boxing Day and New Year's Day. The motto of the Nascar Hall of Fame in Charlotte, North Carolina, is " this is our sport, this is our house" and what a vast home it is. Nascar Hall Of Fame is in the centre of Charlotte, North Carolina. A grand hall welcomes visitors where Nascars are presented in a form that shows you how steep the bankings are at tracks across America in the Glory Road exhibit. It ranges from relatively flat tracks in New Hampshire to some of the steepest at Talladega. Covering every era since its inception on Daytona Beach up to the multi-million pound industry that it has become, there's the chance to try your hand at changing a wheel in a pit stop timed test, racing against other visitors in your own Nascar as part of a simulated game and discovering the history of the sport. It's a glamorous, hi-tech venue and you are surrounded by huge video screens highlighting momentus races and even the most popular drivers and celebrities the sport has attracted to sing the national anthem, including pop star Taylor Swift. If you are thinking about making a day of it and getting food, there's also a cafe on site serving buffalo wings and other treats from the Deep South. Uptown Charlotte, adjacent to the Charlotte Convention Center. Parking is at 500 Brevard Street, Charlotte, adjacent to the Convention Center. Open daily from 10am – 6pm. Entry costs Adult $19.95, Senior (60 ) $17.95, Military $17.95, Children aged five to 12 $12.95. BMW Welt in Munich is an ultra modern museum featuring more than 120 of BMW's best cars, motorbikes and engines. BMW World is housed in an ultra modern, sleek building in Munich. It's housed in a clean, modern building, cleverly designed to fit around the motor exhibits. Although it is in Germany, curators are used to getting international visitors so there are translations in German and English (and other languages). Founded in 1973, this was one of the first ever brand museums and was redesigned and expanded in 2008. That successful expansion means this is now one of the most comprehensive motor museum for a car brand in the world. BMW's motorsport history is included in the museum. Visitors can enjoy deep insights into the car firm's tradition, along with the present and future of the BMW brand. Motorbikes, road cars and specialist motorsport varieties are all given equal billing throughout this huge complex next to the Olympic Park in Munich. BMW World (BMW Welt) is in Munich, Germany. In particular, there's a great presentation of motorbikes where they are all laid out on top of each other on a glass wall. In this House of Motorcycles section, it describes how BMW motorcycle manufacturing developed at the production sites in Munich between 1923 and 1969, and then at Berlin-Spandau from 1969 to the present time. There are more motorbikes within the House Of Motorsport too, which includes BMW's Formula One involvement. For those that drive or admire the every day BMW Series cars, there's the House of the Series. This features the development of individual series and then goes on to document the development of BMW in the executive class and the success of the BMW M models. One of the biggest exhibition rooms is even dedicated to the BMW 7 Series. BMW Museum at Olympiapark 2, 80809, Munich, Germany. Last entrance is 30 minutes before closure. Closed on Mondays, Christmas Eve, Christmas Day, Boxing Day, New Year's Eve and New Year's Day. Entry to the museum costs €10 or €7 for concessions. A family ticket of 2 adults and 3 children under 18 costs €24. 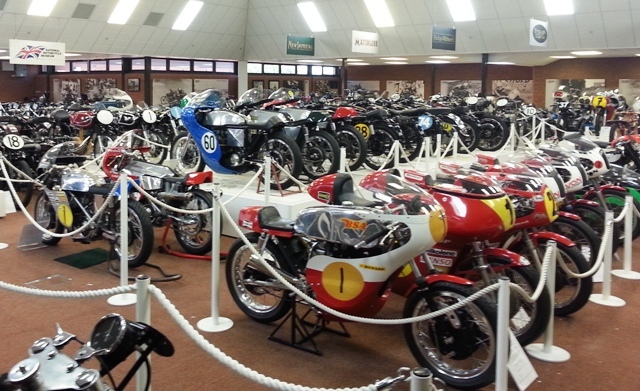 If it's bikes that get your heart racing, then look no further than the largest motorcycle museum in the world - and Britain - in the heart of the country near Birmingham in Solihull. The National Motorcycle Museum has a heavy accent on the British bike industry that flourished up to the early 1960s. There's over 1,000 machines on show across several halls, each of which is dedicated to a certain era, which is probably why this museum attracts around 250,000 visitors a year. The focus is very much on British bikes from the late 1800s to modern day with very few foreign motorbikes - and those that are there, have had some kind of part made in Britain. There's 171 marques in the collection, which covers every period including the pioneer, veteran, vintage and post war eras. 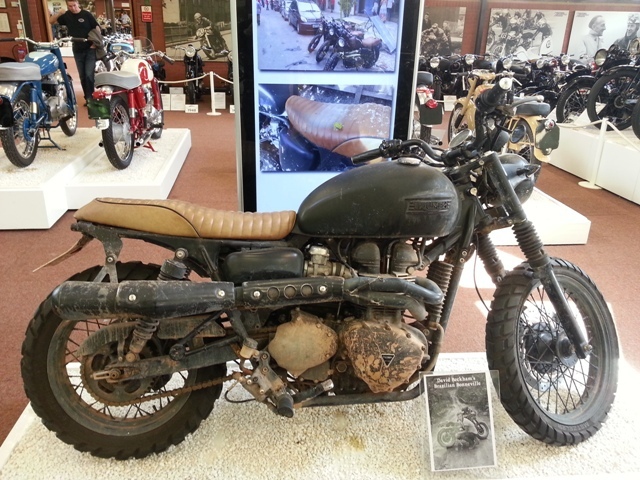 Exhibits range from manufacturers including BSA, Norton, Zenith and Triumph. There's famous bikes too such as the Norton that Steve Hislop won the Senior TT Race on in 1992, beating Carl Fogarty into second place. Opening hours: Every day 8.30am - 5.30pm. Closed on Christmas Eve, Christmas Day & Boxing Day. Entry costs Adults £8.95, Senior Citizens £6.95, Children aged five to 16 £6.95 and Family Ticket £24.95. As expected, this museum focuses heavily on motorsport and Formula One as it sits on the edge of Donington race track, where the European Formula 1 race was held in 1993. It contains the largest showcase of Grand Prix cars in the world and even has a whole hall dedicated to the Williams Formula One cars from the 1970s to current times. It also boasts the largest collection of McLaren and historic Vanwall racing cars in a museum. There's some of the most famous racing cars in history at the Donington Grand Prix Collection including the Lotus that Stirling Moss drove when he defeated the Ferrari Works Team in 1961. 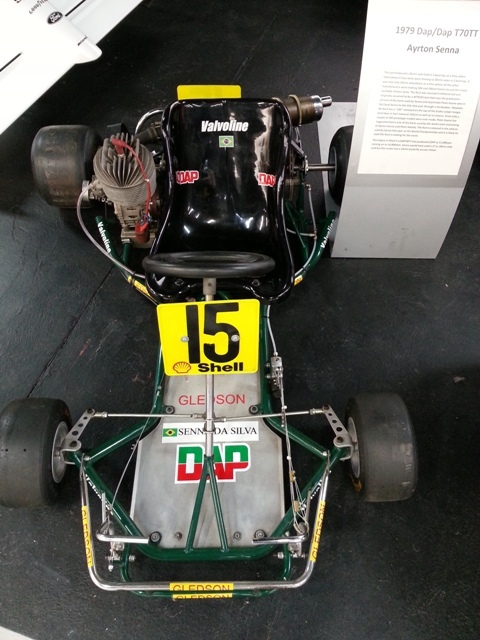 There's even a replica of Ayrton Senna's 1979 100cc DAP kart. DAP was the Italian company that Senna raced for when he first came to Europe and made such an impact on motorsport. Along with the sports cars, visitors can take in the Wheatcroft Military Collection where there are World War Two cars, trucks and motorcycles. Prices are adults £12.00, OAP and students £10, children aged 6 - 16 £5.00, children Under 6 go free.A Family Ticket for two adults and up to three children costs £25.00. Maranello may be a small town in Italy, near Bologna, but this is a big place when it comes to motoring history. This is the home of Ferrari, where the iconic cars are made. In the shadow of the factory are garages offering tourists the chance to drive a Ferrari and cafés that adorn Ferrari flags and photos of drivers from Schumacher to Alonso. Then there's this popular museum. The Ferrari Museum Maranello offers an array of Ferraris on display from vintage classics to the Ferrari F40, the iconic super car made between 1987 to 1992. For motorsport fans, there's the Formula One room complete with all the silverware ever won and a selection of cars to see up close. Meanwhile, a hall of fame featuring all the Ferrari Formula One drivers attracts a lot of attention, but it does have iconic stars like Alain Prost and Michael Schumacher among the throng. Offering a little extra, there's also a section on Ferraris that have been made to order by the richest and most famous along with prototypes in development. One of these is a car that was ordered by Eric Clapton. Open everyday from 9.30am to 6pm (In peak season of April to October until 7pm). Closed on Christmas Day and January 1st. This small but charming museum is at a site of particular historical importance for it looks over on to the beach where so many British land speed records were set in the 1920s. Pendine Sands is seven miles in length on the shores of Carmarthen Bay in South Wales and was the site used before the trend to set records moved to Bonneville Salt Plains in Utah. Malcolm Campbell used this beach in the Bluebird in 1924 to set the world land speed record as no roads were long enough or flat enough in Britain at that time. Interestingly, at the centre of the Museum Of Speed is Parry Thomas' Babs car, which took the world land speed record in 1926. It was buried in the sands after Parry was killed in a subsequent land speed attempt but has now been dug up and restored. This museum is small but has some wonderful artefacts that will keep you entertained for around 40 minutes at most. It was opened in 1996 and is owned and run by Carmarthenshire County Council. There's also motorbikes from Pendine's racing past on show too. Make sure you leave time to explore the beautiful beach where the speed records were set, which now attracts holidaymakers from nearby caravan sites. This motor museum in Beaulieu has made quite a name for itself with 285 vehicles on display, the oldest dating back to 1875. What makes this more interesting is that the cars are displayed in elaborate, creative settings, There's a full scale garage mock up from the 1930s and a tram from that era to step aboard in a reconstructed old fashioned street. The National Motor Museum at Beaulieu is in the beautiful New Forest, which also explains why the leafy grounds are so attractive and it's worth a trip around them on the monorail. There's a mix of vehicles from different eras and special exhibitions mean there is often a celebrity car on show, whether it's from a James Bond movie, Back to the Future or a Top Gear special. Founded in 1952 by Edward Douglas-Scott-Montagu, the third baron of Beaulieu, the museum was a tribute to his father who was a pioneer of motoring in the UK. In fact, his father was the first person to ever drive a motorcar into the yard at the House Of Commons. Opening hours: 10am - 6pm May 28 to September 25 or the rest of the time, 10am - 5pm. Closed Christmas Day. Tickets cost Adults £19 in advance or £24 at the door, children £9 advanced £12 on the door, Senior £18 in advance or £23 on the door. A Family Ticket costs £49 advanced £64 on the door. This museum next to the world-famous Talladega Superspeedway in Alabama not only gives visitors the chance to browse its vast collection of motors, but also the opportunity to take a tour the legendary racetrack. The regular tour heads off in a minivan with an expert volunteer driver who is full of wonderful stories, old and new, that he regales is a bewitching southern drawl. Well this is the deep south. It's a slow turn around the track for around 20 minutes with the chance to hop off and take photos but don't expect any Nascar speeds on this journey. Back at the museum base, the International Motorsports Hall of Fame is dominated by American cars and history but there are also some gems of international importance, like a wonderful black and white photo of the Bluebird. The museum opened in 1983 to preserve the history of motorsports and features sports cars and karts along with memorabilia. Historically, there's genuine stock cars that raced on Daytona Beach in the 1930s. Plus there's the 1940 Mercury Sedan, which raced on the beach. Interestingly it was driven by Sammy Packard, a race car driver and restorer who was the last man alive to attend the 1947 meeting at which NASCAR was founded. There's also karts, such as the Blendzall Special that is labelled as the world's fastest kart for travelling at 152 mph, and quarter midgets of America. In terms of the Hall Of Fame, there's photos of every winner and the Induction Ceremony is held each year on the grounds of the museum to honour new entrants from among the greatest names in motorsports. Historic karts are also in the hall of fame. There's the additional bonus of the McCaig-Wellborn Research Library containing approximately 14,000 books and journals plus more than 10,000 photos in its archives. This is only open on weekdays, except during race weeks. It parallels the I-20 between Exits 168 (from Birmingham) and 173 (from Atlanta). It is roughly 50 miles from Birmingham and 95 miles from Atlanta. Admission: $12 for adults, $5 for kids age 6-12 and free for kids age 5 and younger. Open daily from 9:00 AM - 4:00 PM, 7 days a week with the exception of major holidays (Thanksgiving, Christmas, New Year's Day, and Easter). Brooklands may not be as well known as other museums on this list but it's particularly important as the birthplace of British motorsport and aviation. Built in 1907, it was once a great sporting arena as it was the world's first purpose-built motor racing circuit and parts of the original still stand at Weybridge in Surrey. Visitors have the chance to retrace the route of historic cars and walk along the half of the circuit that remains (the other half has been sold off for housing and businesses sadly). The bits that remain give you an insight into how racing used to be in early part of the 20th Century. It's a banked oval race track, which is now mainly seen in the Nascar speedways in America, and would have been fraught with danger for the daredevil drivers of the era when serious motor accidents were a regular occurance. The whole place is like stepping back in time with an old-fashioned paddock and garages. It was the place to be for many an aristocrat and English romantic author Barbara Cartland was a regular racegoer in the 1920s and '30s. So much so that a room at the museum is now named after her. Brooklands is also the home of Concorde in Britain too. Open every day, apart from Christmas Eve to Boxing Day. Summer opening times from March 1 to late October are 10am to 5pm, while Winter opening times during the rest of the year are 10am to 4pm. Tickets cost £11 adults, £10 seniors, £6 child entry or £30 for a Family ticket.